The U.S. Postal Service has taken the unusual step of releasing a set of helpful tips to help reduce the number of drivers in Florida who have been crashing their cars into post offices. This year so far, eight drivers have crashed into post offices in Central Florida alone. The USPS says the most common causes of such accidents are when drivers step on the gas instead of the brake pedal and when the driver accelerates thinking the vehicle is in reverse and during the annual food drive. 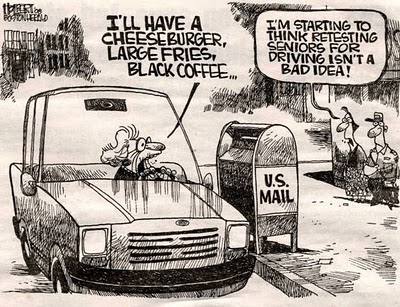 Elderly confused during Post Office Food Drive. This entry was posted on September 21, 2012 at 8:08 am and is filed under Uncategorized. You can follow any responses to this entry through the RSS 2.0 feed. You can leave a response, or trackback from your own site.